In order to take your New Member Ethics Training Course, you will first need to have your NRDS number handy, which should have been provided to you when you signed up at the Association of REALTORS® office. Alternatively, you can look up your NRDS number at any time using Paragon. Simply login to Paragon and click the small monitor icon in the lower-left corner of your screen (next where it says “Session Time Remaining”). 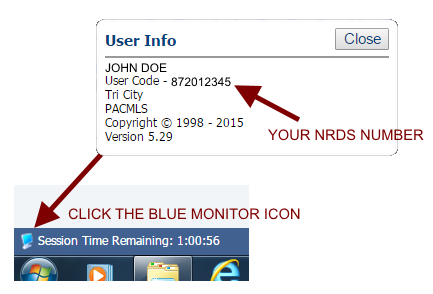 Your NRDS number is shown just under your name and represented as the “User Code” (see sample screenshot below). When you’re ready, CLICK HERE to visit NAR’s website and take your REALTOR® Code of Ethics Training now. Alternatively, if the link above does not work, you may visit www.realtor.org and look for Education and Ethics Training.